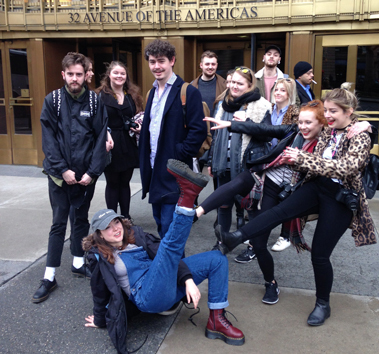 Phil Dearman, senior lecturer in creative advertising at Bucks New University, recounts a recent trip to the Big Apple with a group of mostly female student creatives in search of inspiration. Our flight from London to New York was half-empty. Passport control at JFK had no queues. The immigration officer checking my details was weirdly friendly. Baggage reclaim was over in a jiffy. Apparently, a lot less people have been visiting NYC since King Donald took over. Yet while the new president wants to put up walls, New York’s creative community has a very different mind-set. Arranging agency visits for our annual Bucks New University Creative Advertising study trip has never been a walk in Central Park but this year it was a lot easier. "Thanks for reaching out!" "We’d love to see you!" "Seems like a great time to be making friends!" Big, small, digital, integrated - agencies of all sizes and specialisms were keen to meet and greet us. As tutor in charge this year, my Manhattan project was to arrange as many inspirational visits to as many varied ad businesses as I could in four days. I also wanted to engage as many female speakers as possible too. That’s because this year’s student group is predominantly female and I wanted these women, so important for the future gender balance in UK creative departments, to meet inspirational role models. In the end, I lined up 12 top shops over four days. So where did we go? And what did the students learn? 11.30am Madison Avenue: Trendy is the word for Sparks and Honey, a trending agency with walls of flat screens and herds of digital analysts. Cultural strategist, Cory Sessum toured us around before we sat down to its lunchtime "Open House" discussion that lets anyone experience an hour of insightful comments into whatever was deemed most interesting that day online. It was like a game of mental pinball as topics as random as "Kidult Cosmetics" and the power of "Positive Negativity" were discussed. The frenetic pace made for a vibrant start for the students. 2.30pm Madison Avenue: The presentation at Tribal took place in the most elegant agency cinema I’ve ever sat in, or in the students’ case, ever slumped in. Plush, individual leather seats cosseted us as we took part in a stimulating Q & A session with a female CD, Becky Kitlan on the nature of today’s ad business and how rapidly it’s evolving. Among much helpful advice, she told the women students to always speak their mind, (something she regretted not having done enough in her early working life), develop creative interests outside work and never stop networking. 5.00pm Fifth Avenue: Only in New York would you witness a creative director enter the room on a hover board as if it was the most normal thing in the world. But that’s what happened at Brooklyn Brothers, where the CD, Stephen Rutterford went on to promote the power of film making and the need for copy more than ever. "Make short films in all types of media and write to lots of different time lengths", he suggested. "You should study old ads for copy, as even tweets need to show a clever turn of phrase." Sage advice, hoovered up by the students. 9.30am Soho: At digital behemoth 360i, the grandly titled dean of the agency, Mark Avnet, gave us a two hours master class on presenting and the need to tell stories. "Stories are sticky," he said before going on to evangelise about the need for students to work on the three "P"s: passion, purpose and perseverance. The group are going to need these three attributes as it is only day two and they look decidedly jet-lagged. 12.30pm Fifth Avenue: It was the turn of two female recruiters at Grey, Sarah Hokanson and Christina Vega to offer some advice on job-hunting. They frightened the students by saying they see 20 to 30 books a day, spending only 180 seconds reviewing each one. Their best advice about getting a first job? Don’t be picky. If that didn’t surprise the students, hearing that US salaries can start anywhere between $40 and $50k certainly did. 4.00pm Brooklyn: On to Stink Studios, where senior female content producer Belinda Reichel made the case for non-traditional agencies using inter-disciplinary teams, involving UX, developers and creatives, working in different ways on projects with non-traditional directors. She suggested the students should invoke the mantra, "No idea is too stupid" and work hard to stay ahead of tech advances and stay inspired. The students left, suitably inspired. 10.00am Sixth Avenue: Kicking off the day at Cunning, the aptly-titled "head bloke", Mark Voysey talked about what being a brand experiential shop entailed and how experiential can really be anything. Case studies brought to life the importance of strategy, idea, planning and execution. Key advice he wanted to pass on was, "don’t be shy about putting mad ideas out there" and "hunt out the white space on the comms landscape". 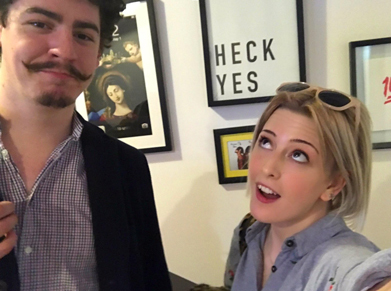 6.00pm Broadway: Tom Phillips creative director and Bucks Uni Advertising alumnus has been hosting student trips at Exposure for over a decade. He didn’t disappoint this year. His entertaining personal take on his agency’s work and the ad world in general went down well with the students, almost as well as the free beers he was handing out. 10am Broadway: One of Anomaly’s senior female managers and creative recruiter, Benita Conde used impressive agency studies to make the case for emotions being at the core of social advertising today. To tell a brand story today and do that well you must have the right skills, she said. Craft skills were crucial. "Improve your craft skills and you improve your employability," was her parting shot. 1pm Wall Street: Everyone had to sign non-disclosure forms in advance of arriving at Droga5’s Wall Street HQ, and then said not to take any photos, (hard on the students given the stunning views the agency has over the East River), so I am not at liberty to reveal much about what the agency's junior creative Chloe Grindle told the group beyond this priceless advice, "Be interesting and be interested." The rest must remain hush-hush. 4pm Hells Kitchen: By late on Friday afternoon, we had made it to our last agency, Deep Focus, where the chief creative officer John Reid introduced himself as an integrated digital creative while twirling an American football on one finger. I was impressed. His main advice was to keep up to speed with what is happening if you want a well-rounded book. And be the first to try out new things. By the time he had finished talking, the students has sat through 12 presentations and listened to a total of 30 creative soothsayers who had done their best to educate, enthuse and advise these limey tyros. The students had kept their focus, asked good questions, taken copious notes and learnt loads. They had had a study trip to remember. And they had earned their last beer in Brooklyn. The trip to New York was an incredible, once in a lifetime experience. 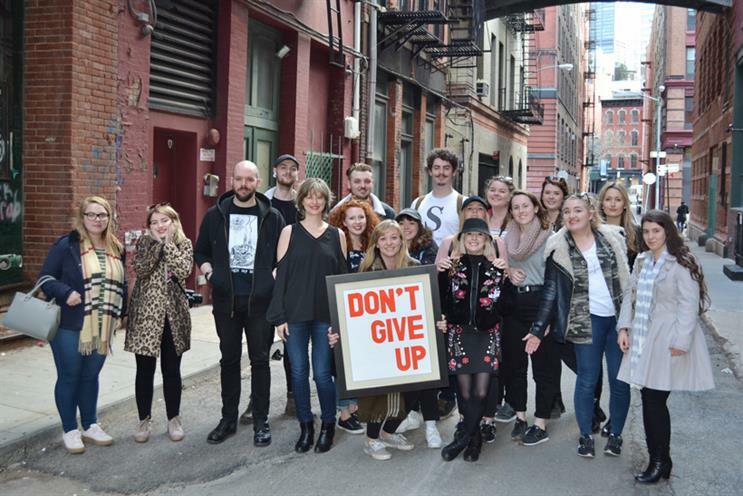 Not only did we get exposure to the wonderful culture and sights of New York but we also gained first-hand experience with incredible agencies like Exposure, 360i and Anomaly, to name just a few. We found that there were big differences in the industry culture, which we hadn’t really expected, particularly in regards to creative pairs, or a lack thereof in the US. Visiting such a wide array of different agencies really opened our eyes to the huge spectrum of creative work, which we found hugely inspiring. When we returned to the UK we had a completely fresh take on the advertising industry and a recharged motivation to work hard and continue to be high-flying creatives.